The answer to the question ‘’Where is the center of Istanbul?’’ in most people’s mind is Taksim Square and Istiklal Street. Taksim Square really sits on the roads that connect visitors to the most touristic spots in the city. When you go to Siraselviler Street from Taksim, you can reach Cihangir, which is famous for its cafes and art activities, and Cukurcuma Street, which is famous for its antique shops. If you go to the sea direction, Kilic Ali Pasha Mosque in Tophane neighborhood and recently renovated Kilic Ali Pasha Hamam will welcome you. After you pass by the mosque, you can see various cafes and bars at “Kilic Ali Pasha Mescidi Street”. The reason why so many cafes and bars are in this area is the rising popularity of Karakoy in recent years. How to Go from Taksim Square to Tophane and Karakoy? How to Go to Galata Tower and Karakoy from Taksim Square? The most fun way to go to Karakoy is Istiklal Street. 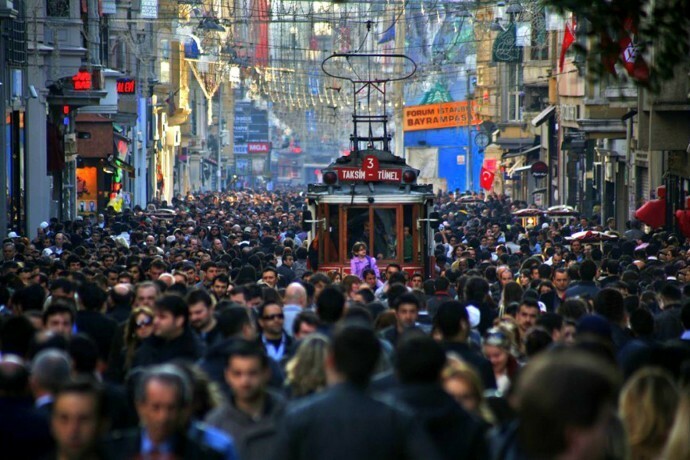 You can walk through Istiklal Street, the most popular street in the city, from one side to the other. The three main squares that compose Istiklal Street are Taksim Square, Galatasaray Square, and Tunnel Square respectively. The side streets of these squares offer various options for entertainment. For example, Nevizade which is next to Istiklal, Asmali Mescit, and Mesrutiyet Street are such vibrant and colorful streets to discover. When you walk from Istiklal Street’s one side to the other, you will reach F2 Funicular Line at Tunnel Square. You can reach Karakoy easily via the funicular line. However, a walk through “Beyoglu District” is definitely more fun and recommended. Galip Dede Street from the Tunnel Square is a road where tens of musical instrument shops are lined one next to another. You can also see Galata Mevlevi House Museum on this road. Galip Dede Street is a by-street that connects the square between Istiklal Street and Galata Tower. If you want to discover Galata Tower and nearby streets, you can also see Things to Do in Galata post. 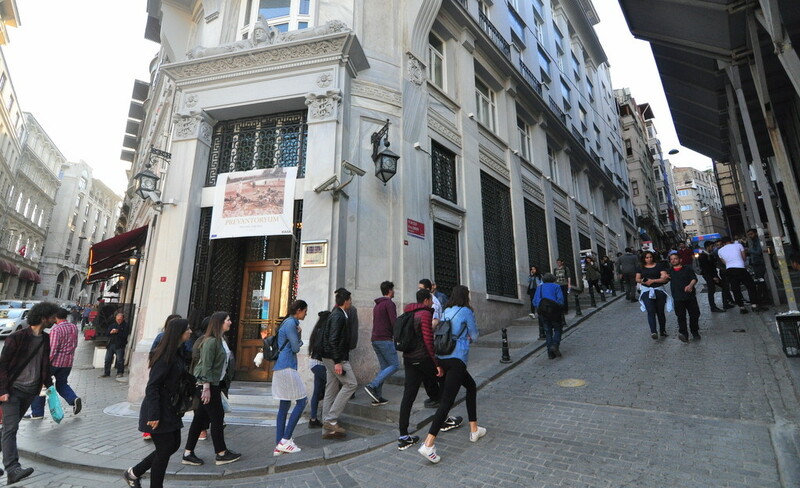 After you see the square that takes you to Galata Tower and if you keep walking down, you will realize you are walking on Yuksek Kaldirim Street. This street will enable you to reach Karakoy Tram Station, Banks Street, or Galata Bridge. How to Get from Karakoy to Galata Tower? As one of the fastest developing neighborhoods in Istanbul, Karakoy houses tons of cafes, bars, hotels, and restaurants. 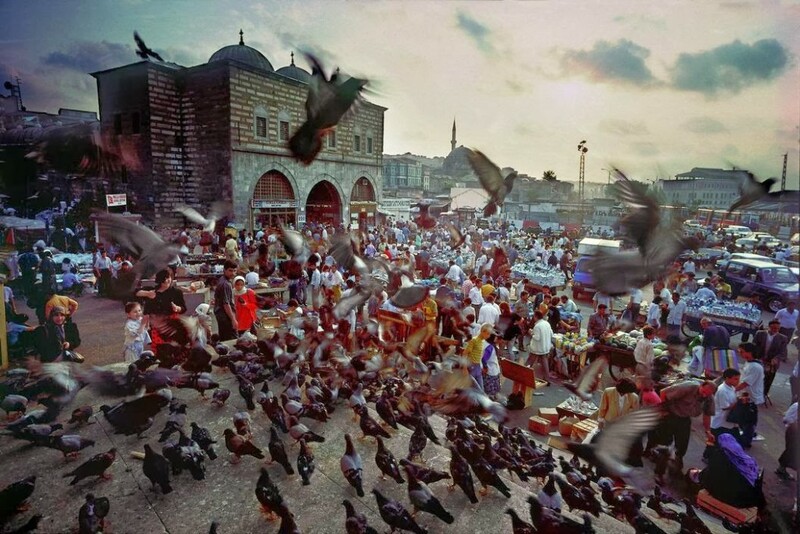 If you want to discover Karakoy, you may want to read Things to Do in Karakoy article. 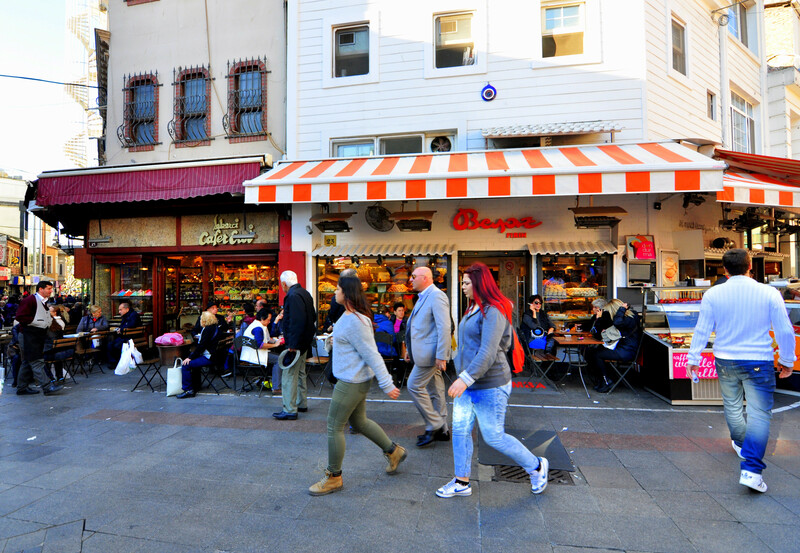 Tarlabasi Boulevard is not in the list of fun streets to walk, but it functions as a busy road that connects Taksim Square and the Istanbul Old City. Via Tarlabasi Boulevard and Ataturk Bridge that follows the boulevard, you can reach Fener, Balat, Unkapani, Sehzadebasi, and Vezneciler with ease. For example, it will take you only 10-15 minutes to reach Sehzadebasi (Sehzade Mosque) and Vezneciler (Suleymaniye Mosque) by a taxi ride from Taksim Square if there is no traffic jam. Then, you can visit historical monuments like Suleymaniye Mosque and Grand Bazaar quite easily from here. 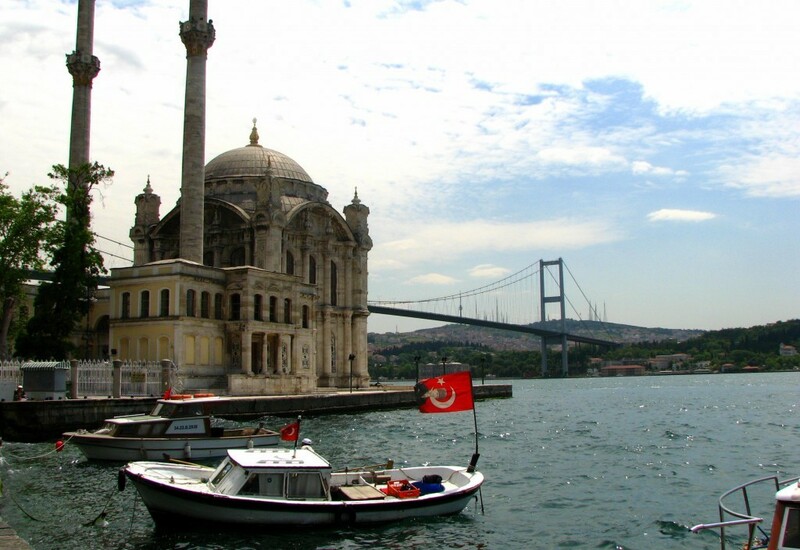 How to Go from Taksim to Istanbul Tourist Attractions? 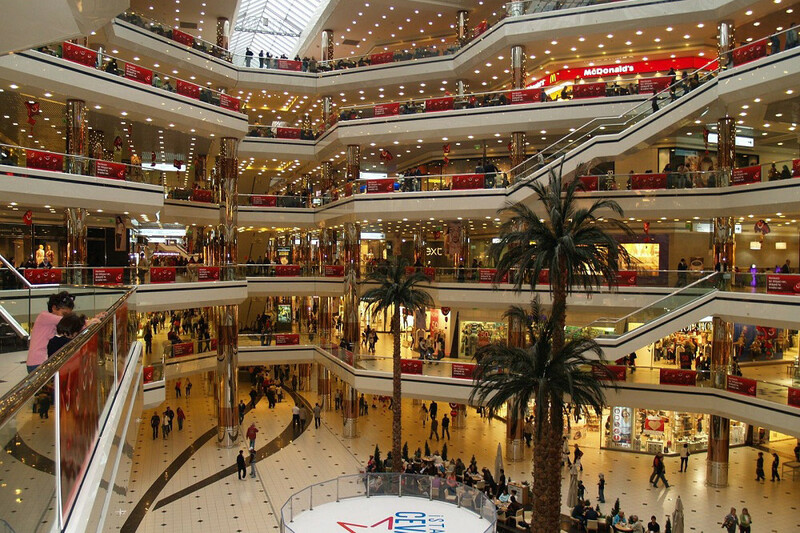 How to Go to Harbiye, Nisantasi, and Sisli from Taksim Square? Cumhuriyet Street that takes you to Harbiye from Taksim Square will connect you to Istanbul Congress Center and the luxury hotels nearby easily. The most luxurious hotels in Istanbul such as Swissotel, Ritz Carlton, and Intercontinental are located in Harbiye and Macka. When you reach the end of Cumhuriyet Street, you will see the road diverges into two. The road to the right will take you to Nisantasi, which is famous for its luxurious fashion boutiques and shopping centers. If you plan to go to Osmanbey, Sisli, and Mecidiyekoy direction from Taksim Square, you need to take the road to the left at the end of Cumhuriyet Street. This road will take you to Sisli which is surrounded by shopping centers like Cevahir and Kanyon and hotels like Mariott. How to Go to Eminonu (Spice Bazaar) from Taksim Square? 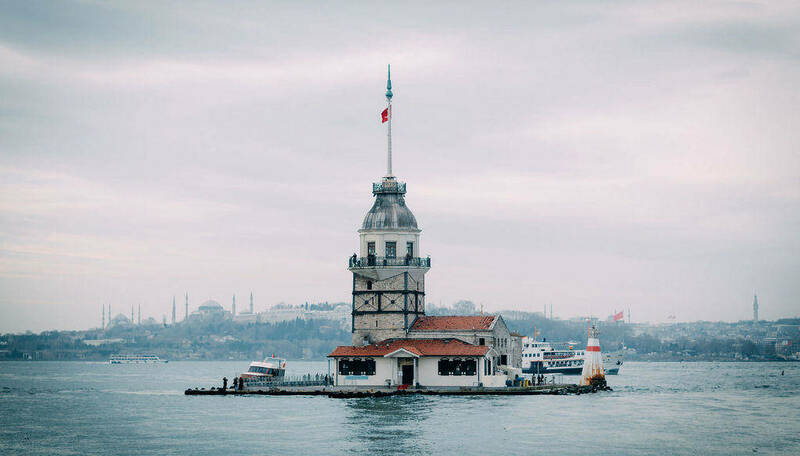 I formerly mentioned how to go to Galata Tower from Taksim Square via Istiklal Street and Galip Dede Street and how to go to Karakoy via Yuksek Kaldirim Street. As Eminonu and Karakoy are the two sides of Galata Bridge on the Golden Horn, after you reach Karakoy, you can walk to Eminonu easily. If the weather is too hot, crossing the other side via air-conditioned tram instead of walking sounds more convenient. You can take the tram and get off at the next station. More reading about Spice Bazaar which is located at Eminonu. How to Go from Taksim to Eminonu and Spice Bazaar? How to Go to Sultanahmet (Hagia Sophia or Topkapi Palace) from Taksim? 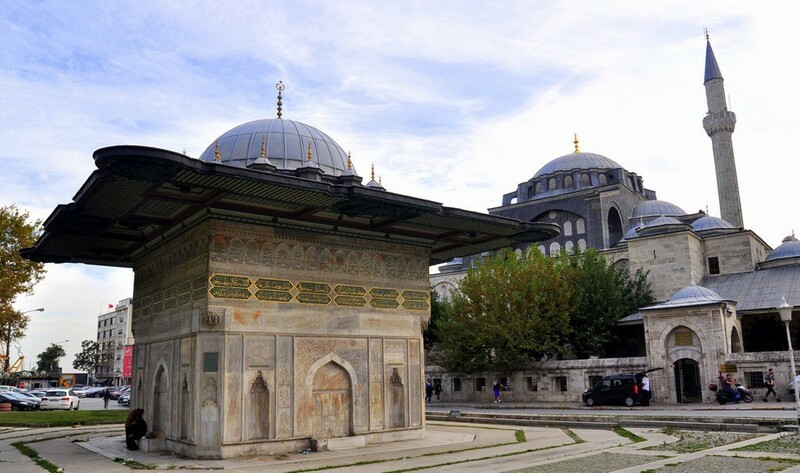 There are a few ways to go to visit the historical monuments at Sultanahmet from Taksim Square. 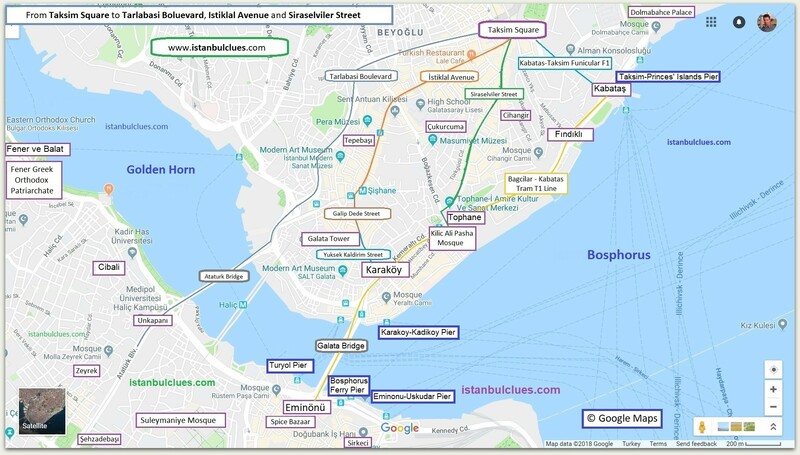 You can connect to Kabatas from the metro at Taksim Square via Funicular F1 (Taksim-Kabatas) Line and you can go as far as the center of Sultanahmet. This way is highly recommended. Alternatively, you can take the metro from Taksim Square, Metro M2 (Yenikapi-Haciosman) Line and go to Yenikapi. Then, you can walk to Aksaray Tram Station and take a tram ride to Sultanahmet, which takes approximately 10 minutes. If your hotel is near the Galata Tower, you can walk to Karakoy and reach Sultanahmet by T1 Tram Line with ease. Therefore, you will not only reach your destination by a single vehicle but also discover the beautiful streets in Galata and Karakoy neighborhood. It will take approximately half an hour to go from Taksim to Sultanahmet Tram Station. 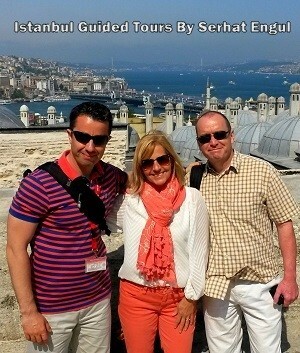 After you reach the station, you can walk to Hagia Sophia, Topkapi Palace, Basilica Cistern, and Blue Mosque easily. Yo may read Places to Visit in Sultanahmet to learn more about the area. How to Find the Sultanahmet Tram Stop? How to Go to Beyazit and Grand Bazaar from Taksim? Tram is the best way to reach Beyazit where you can find the best local restaurants, second-hand booksellers, and Grand Bazaar. As I mentioned above, Funicular F1 Line and T1 Tram Line are the best ways to reach the touristic areas in the Old City such as Sirkeci, Sultanahmet, and Beyazit. How to Go to Ortakoy and Bebek from Taksim? There is no way to reach Ortakoy, a popular weekend gateway spot for Istanbulites, from Taksim Square by a single ride. The best way to reach Ortakoy from Taksim is to take Funicular F1 Line and go to Kabatas and take one of the IETT (the company that manages public transport in Istanbul) buses that go to Ortakoy, Arnavutkoy, Rumeli Hisarustu or Istinye direction. Ortakoy is the most popular spot for the people who want to take amazing Bosphorus photos in Istanbul. The view of Ortakoy Mosque and the Bosphorus Bridge is a classic one. Therefore, the perfect harmony between these two is the first image when it comes to Ortakoy. After you spend some time in Ortakoy, you can take a walk at Ortakoy-Arnavutkoy-Bebek direction. This walking route takes approximately 30-40 minutes to walk. Then, you can drink your coffee at Bebek while enjoying a majestic Bosphorus view. As the same route is used to reach Ortakoy or Bebek, we don’t really need to give directions to Bebek again. Moreover, you can reach Rumeli Fortress via the same route as it’s on the same direction. How to Go to Mecidiyekoy and Sisli from Taksim Square? There are two ways to go to Sisli from Taksim. You can take one of IETT buses to Sisli direction. As the distance between these points is too short, a bus ride can take you to Sisli quickly. However, as the density of traffic may change depending on various reasons in Istanbul, we really can’t calculate how fast you can reach your destination. The good news is there is a way to avoid such a situation. In order to be safe from a bad surprise in the traffic, you can go to neighborhoods like Sisli, Mecidiyekoy, and Levent from Taksim Square by metro with ease. The only thing you need to do is to walk down the metro station at Taksim Square and take the metro to “Haciosman” direction. Then, you can get off at a station that you want. How to Go to Kadikoy from Taksim Square? There are a few ways to reach Kadikoy from Taksim Square. The most fun way is to take a ferry from Karakoy and crossing the Bosphorus with a 20-minute ride while enjoying a unique Bosphorus view. You can go to Tunnel Square from Taksim Square by T2 nostalgic tram and reach Karakoy via F2 Taksim-Karakoy Funicular Line. When you walk to Karakoy Square from the Tunnel, you will see an underpass. After you take the underpass and walk past by street vendors that sell numerous kinds of stuff, you can take Karakoy-Kadikoy ferry at Karakoy Pier and reach Kadikoy in 20 minutes. More information provided in Things To Do in Kadikoy blog post. 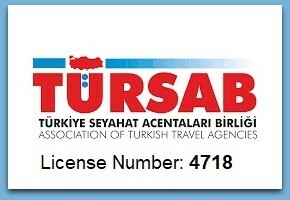 How to Go to Uskudar from Taksim Square? Uskudar is one of the most popular and historical neighborhoods on the Asian side of Istanbul. You can see the traces of the Ottoman architecture in Uskudar and find traditional restaurants such as Kanaat Restaurant and hundreds of old historical mosques in this neighborhood. Furthermore, you can walk to the neighboring areas like Beylerbeyi, Cengelkoy, and Kuzguncuk and take a lot of amazing photos. Additionally, you can visit the Maiden’s Tower, the symbol of Uskudar. The easiest way to go to Uskudar from Taksim Square is to take F1 Funicular and reach Kabatas. From here, you can take a Dentur Boat that runs frequently to Uskudar direction from the early hours of the day. You can take the same boat on your way back to Taksim from Uskudar too. How to Go to the Prince Islands (Buyukada, Heybeliada) from Taksim? The Princes’ Islands tops the list of the most favorite weekend getaway spots for Istanbulites. Buyukada, Heybeliada, and Burgazada are the most preferred islands among visitors. It’s quite easy to reach the Princes’ Islands from Taksim Square. Firstly, you can walk to the metro station which is located in Taksim Square, go to F1 Funicular Line and reach Kabatas. Then, you can take a ferry to the Princes’ Islands from Kabatas. The ferry ride takes approximately 1,5 hours. However, it will give you tons of opportunities to take brilliant shots of Istanbul. How to Go from Taksim Square to Princes’ Islands by Ferry? 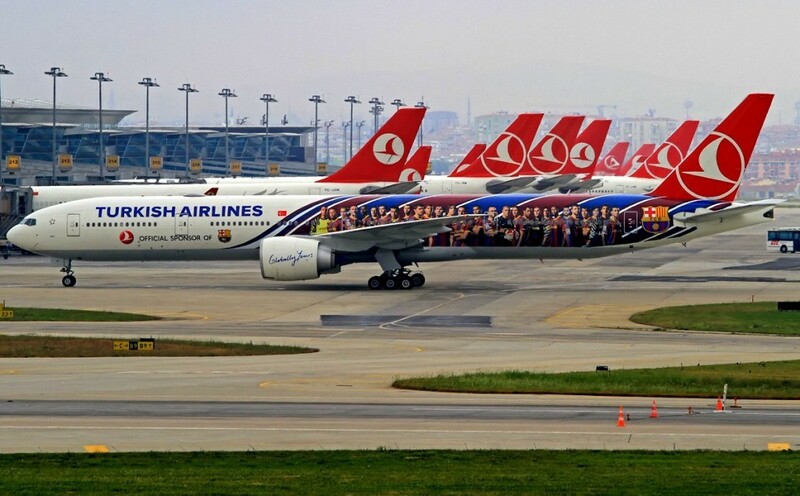 It’s really easy to reach Ataturk International Airport from Taksim Square. 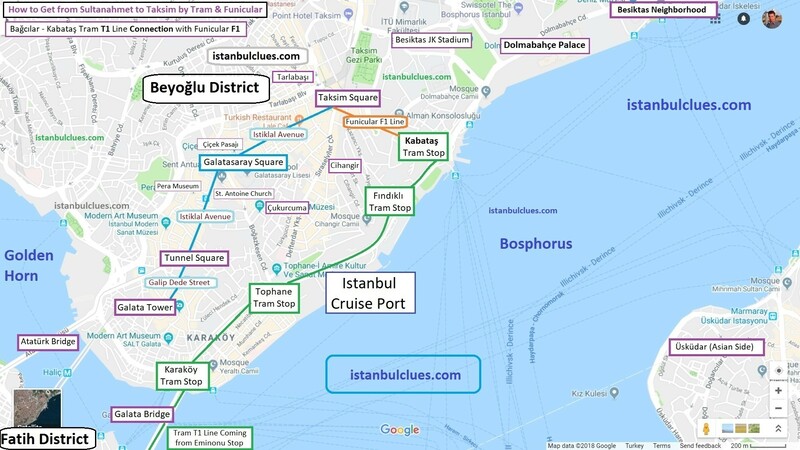 You can take the metro at Taksim Square and go to Yenikapi via M2 Haciosman-Yenikapi Metro Line and connect to Airport Metro M1 Line from there. Therefore, you can reach the airport via underground directly. As an alternative to the metro, you can take a Havabus Shuttle from Taksim Square to Istanbul Airport. If you prefer to go by land, this is a good option as these vehicles have high baggage capacity. Therefore, you will save yourself from the trouble of carrying your luggage to Domestic or International Departure section. Again, Havabus Shuttle can be used to reach Sabiha Gokcen Airport. If you prefer to go by land, this will be the best option. As the distance between Taksim Square and the airport is too long, Havatas is the cheapest and easiest option without having to carry your luggage or connect to another means of transportation.